It’s been longer than I was expecting since I last posted something. I moved to a different city late last year — from Berlin, where I lived for nearly 20 years to Cologne. It took about 8 months to find a new apartment, and I still don’t have the internet connected. I’m happy here in Cologne, but I found that for the first time in my life I actually miss the place where I was previously living. Berlin was the first place I ever really felt at home in, (I was actually born in Australia, where I lived till adulthood), but it is also just such a fascinating and utterly weird city. In terms of its history, Berlin is itself a living museum. Germans, and especially Berliners, are usually just horrified by or numb to the various bizarre things that one encounters at virtually every street corner, but for outsiders like me, it is usually fascinating, mind-blowingly weird, and only occasionally horrifying. Cologne too has a fascinating history, of course, but in comparison to Berlin it’s just not in the same class of historical weirdness. So I’m going write a little about Berlin, but first let me say I’m sitting here in Cologne, at the Aachener Weiher, in a nice cafe by the water. I’ll take a photo…. 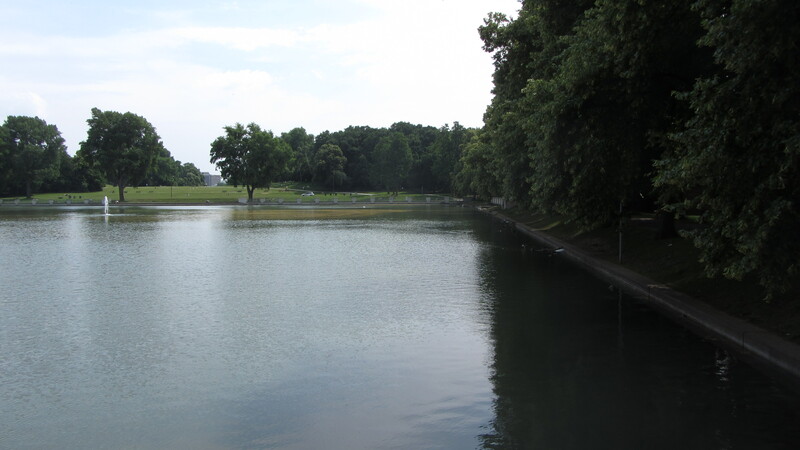 The part that is under water was previously a Nazi parade ground. After the war (in which 80% of Cologne was destroyed) the people dumped the rubble from destroyed houses on one side of the parade ground, creating a hill, upon which they planted trees. They flooded the other half with water from the canal to make a shallow lake where no more Nazis are going to be marching about. But now on to my old home in Berlin. I lived in a comparatively sedate district of the former West (Schöneberg) — not somewhere cool like Kreuzberg. But a brief walk around the area reveals this house, photographed in the early 1900s. A little further on, is a huge bunker that couldn’t be demolished so it’s still there. Next to it, someone built a quite hideous mass-housing project in the early 70s. What has disappeared, however, (demolished in the 1970s) is the Sportpalast — a large arena which was previously the scene of Nazi events. Here in 1943, Goebbels gave his infamous ‘Total War’ speech, where he informed Germans that the war had reached a point where there was no other choice apart from investing absolutely everything on victory or capitulating and being slaughtered by the Russians. Can we just note for moment here, that for all the neo-colonialist capitalist hegemony that the US sent out into the world, they also managed in Germany to supplant Nazi propaganda with the music of Hendrix within a couple of decades. Turning right from here there is a leafy and rather sedate area where recently built apartment blocks are visible through the trees. Also visible is part of a hideous windowless concrete wall…. …..Well I guess some buildings are just ugly…. And nothing more is thought of it, until one day, one realizes that nope — that thing is really weird. WTF is that thing? Closer inspection, peering through the foliage, reveals what looks like a huge lump of concrete balanced on a narrow column made of brick. Ok, yes, that is indeed really weird. Well, what in god’s name is it???? The answer — as so often in Berlin — is that it is indeed exactly what it looks like: a huge lump of concrete balancing on a brick column. In German, a Betonklotz. (Beton=concrete; Klotz=a, um, well, huge lump of something.) Or more correctly, a Schwerbelastungskörper (very heavy thing that is supposed to be very heavy). …… So, Albert Speer had it constructed. It’s not far from where the massive sandstone columns for the southern gate of the planned ‘great’ city of Germania were to be placed. Speer was concerned that the columns would sink into Berlin’s sandy floor, and wanted to measure the rate of sinkage. And it is indeed slowly sinking. But until it does completely in a few thousand years, no one quite knows what to do with it. Today there’s a small hut with information about it, but until a few years ago it was just kinda, sitting there. 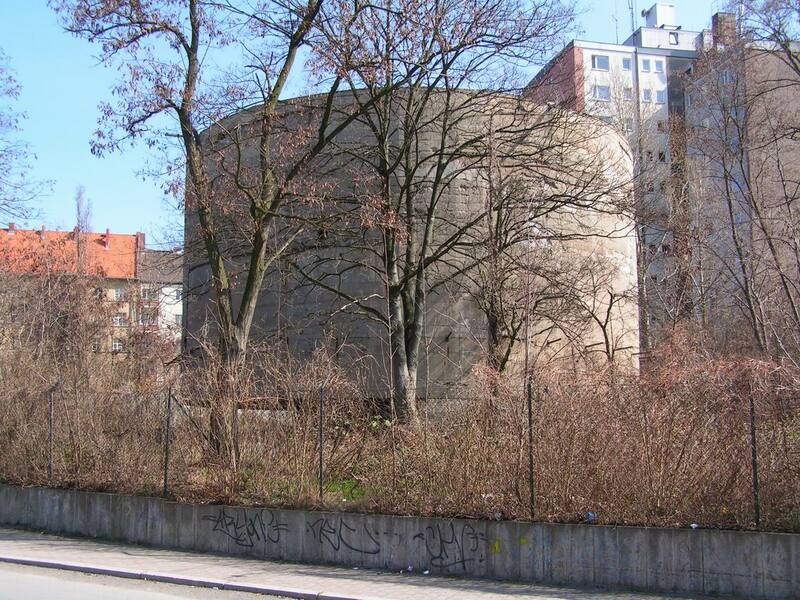 That whole area was previously a Prussian military area, with the former officer’s quarters turned into housing. The nearby Tempelhof Airport — also an airport used by the Nazis, who built massive halls and administrative buildings around its perimeter. Today the whole thing is empty and the airport unused. In the neighbourhood, the ventilation shafts for the military’s underground air raid shelters stand around, ignored, between the trees in the park, and playground equipment. An improvised prison used by the SA (fore-runner of the SS) is also there to be unwittingly stumbled upon. Taking a hike back again, we come to a rather unremarkable building — the Town Hall, where John F Kennedy gave his famous “Ich bin ein Berliner” speech. 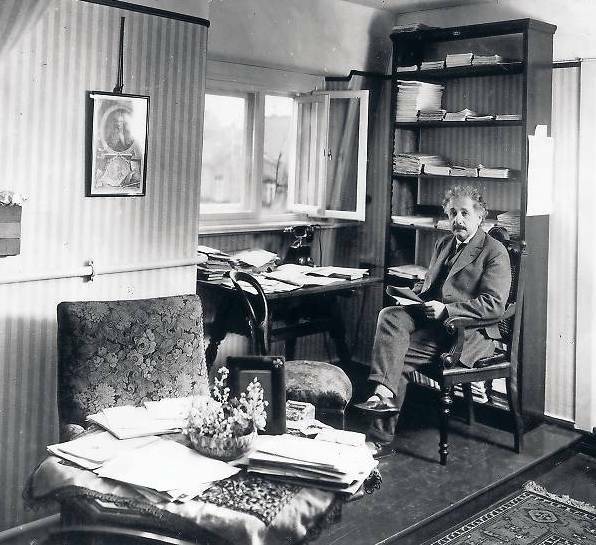 A little further, there’s the apartment where Albert Einstein lived from 1923 to 1934 (or rather where it was until it was later destroyed by WW2 bombs). I grew up in Australia, on a diet of English culture. The Second World War was of course still an indelible memory for those who lived through it, and equally incomprehensible for those who didn’t. The fact of it was ever-present. Each week, it seemed, there would be at least one documentary about the War, with the inevitable funereal voice intoning over sombre music and phantom-like black and white footage that was as incomprehensible as it was undeniable. It was always presented as if the silent question is being repeated — How could the Germans not know? Almost as if the Germans in the 1920s should have instantly recognised Hitler’s name from the history books. And almost if the rest of the world could only look on helplessly as the inevitable litany of events unfolded. Of course, it was not obvious. And of course, as many Germans were revolted by Hitler as were enthralled, with many others deciding that National Socialism was preferable to effectively the only other choice — Stalinism. And the world did not look on in horror. The US tacitly supported Hitler during the mid 30s, seeing the regime as a bulwark against the spread of communism. The British considered an alliance with Mussolini, and the English royal family maintained secret contact with Nazis throughout the war. And of course Hitler was famously nominated for and very nearly received the Nobel Peace Prize in 1938. But for my generation, it was part of the mythology that we grew up with — the victory over the demonic Nazis; the triumph of good over evil. It was, for my generation, both as ubiquitous and as incomprehensible as mythology. 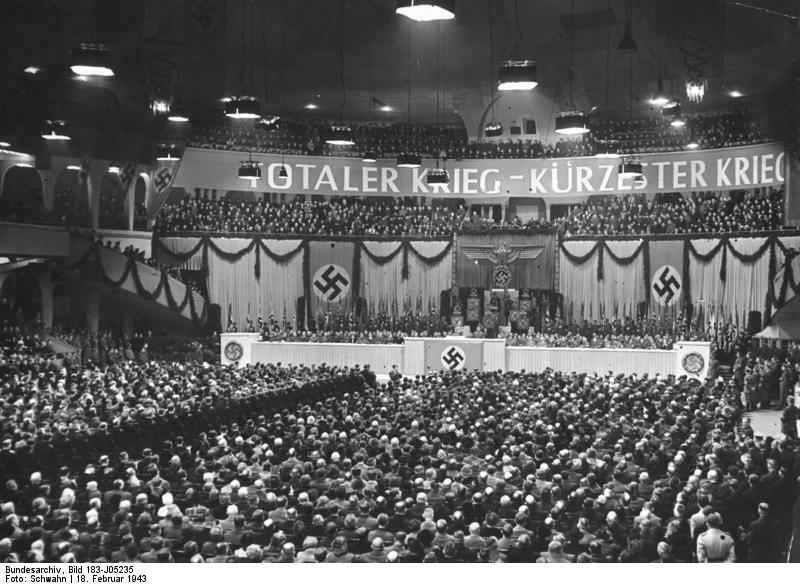 The history of the Nazis seems to occupy a mythological realm, removed from everyday reality. Even further removed from reality than horrors usually are. For a dozen years or more, all this history was, as I keep repeating, as undeniable as it was incomprehensible. That changed in some measure due to several factors and one event, and what had been abstract suddenly became rather more real to me. For my work, I had to find a care home for a handicapped kid I worked with. I visited a care home in Pankow in the north of Berlin, (in the former East and before that a strongly Nazi district). The home had been run by the evangelical church since the late 1800s. 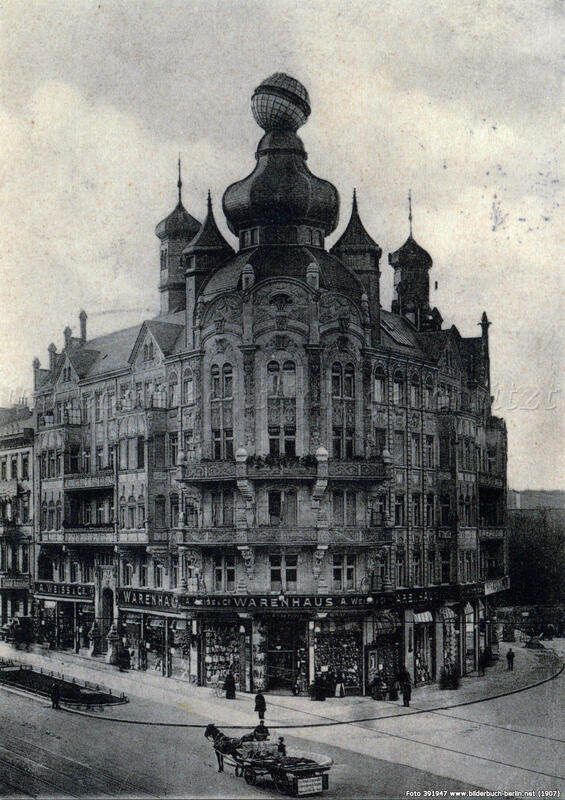 A display cabinet had a timeline showing the history of the building: in 1880 it had been a Mädchens Rettungshaus — ‘rescue home for young women’; and from 1920-27 it was an orphanage. Then the timeline stopped abruptly and only started up again in 1950, by which time it was a home for handicapped children. But it is clear. If it was already a home for….. the handicapped…. (I find myself shuddering and avoiding typing a word — ‘children’)…. it would have been sending many of them to the infamous instituion in the neighboring district of Buch. This is where certain members of our species decided to eliminate those whom they considered useless or unworthy. This was the new ‘T4’ program they were starting to experiment with, whereby poison gas was used to kill people in a swift and systematic manner. For some reason, stumbling upon that blank space in the timeline pushed me into a blank space in my brain. I remember getting in the tram afterwards and half expecting it to take off like a horrifying rollercoaster ride. Shortly afterwards I visited a small exhibition about Jewish-owned buildings in the inner-city that the Nazis had taken over. One of the exhibits was something that had been found in some old storage area of one of these. It was a large roll of bright yellow fabric, upon which was printed — in orderly rows like hearts or roses or paisley patterns — five-pointed stars, with the word Jude in the center of each. There were some empty spaces where some had already been cut out. For some reason, the thought of some official in an office lazily cutting around the perimeter of each, sliding it into a carefully folded official letter and placing it routinely into an envelope shocked me. I think I recoiled for a few steps, as if struck by lightning. Here in the cafe in Cologne, I’m looking out at this old parade ground — not at goose-stepping Nazis, but at real geese who are splashing about happily in the water. One day, while wandering about in the leafy suburb of Dahlem, I noticed something on a church which I had walked past many times previously. This time I happened to notice that the particular style of lantern on the side of the building probably placed its construction year in the 1930s. 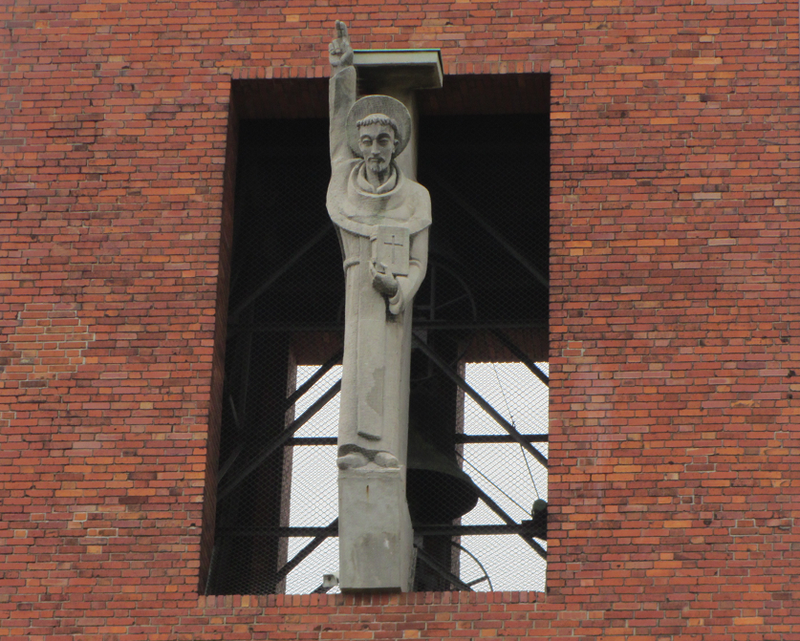 Then my gaze wandered up the spire and came to rest on the statue that had been placed atop it….. Um…. I raced back home and checked the internet. Yep — the church was built in 1934 and that statue was placed there in 1936. that’s St Bernhard of Clairveaux giving the Nazi Salute. You won’t see this referred to in any historical guide book or anywhere on the internet, or by any ‘Nazi Berlin’ tour guide as far as I know. I suspect the reason for this is because no one has seen it for what it is — exactly what it looks like. Another, rather less scrutible but distinctly happier artifact is to be found in the former East, near the old border crossing in the south of Berlin. 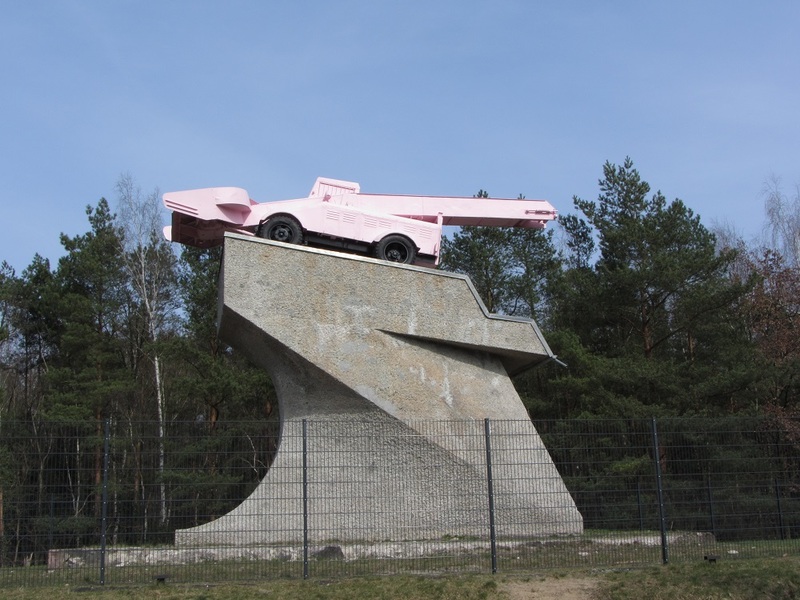 On a hill above the Autobahn, the Communist Government had placed an old Russian T15 tank on a typically Soviet-styled concrete pedestal, as a memorial to the capture of Berlin by the Russians. In the wild and confusing months after the Wall fell, someone gained access to some heavy lifting machinery and removed the tank. …..A snowplow that has been given a tasteful coat of pink paint. No there is no explanatory plaque. I could keep going much longer with all this weirdness stuff about Berlin, but I’ll just stop. Thank you for reading. Yakaru, really interesting stuff. You should do more of those thoughts at some time (but surely we’re not done with old Brucey yet are we?). It left me wondering how old you are, as the text doesn’t quite give it away, but it would be interesting in terms of the history. You probably told me once, but I’ve forgotten. That Warenhaus is amazing – pity the globe isn’t there anymore (I guess that’s what it was)…and the concrete block testing the geology. Very moving section on the missing time-line of the kids’ home. It must be hard to know how to record that, factually or with silence, it’s all inadequate. I think lots of people share your feeling that the whole Nazi disaster wasn’t quite possible in this reality, despite knowing in our heads that it happened. It doesn’t feature quite as much in my life. My parents were youths in England when the war broke out and they were evacuated from Newcastle to safer rural homes. They didn’t make a point of telling me much about the war – probably thought it too horrific – and instead they told me about their lovely time playing about in the fields (Dad), or awful homesickness (Mum), but watching the planes go over and knowing the cities were being bombed on both sides of the Channel. My main personal connection to it is that my Dad’s older brother joined the Air Force, and I have a missing-presumed-dead airman for an uncle, in honour of whom I got my middle name. I agree with the above comment that you should do more like this. What a fantastic post! 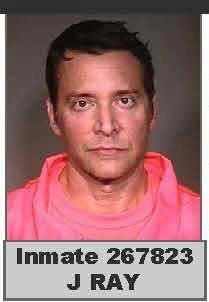 I enjoyed it very much indeed. Thank you for an enjoyable read. I had a nice time following the places you mentioned on a map. I am fascinated by the Schwerbelastungskörper. Gee, thanks for your comments! I was unsure whether to post this or not, and wasn’t expecting anyone to read it. Maybe I’ll write something about the area south of Berlin where I lived for a time in 2000: until 1994 the area was closed off as a garrison & training ground for 40,000 Russian soldiers; before that it was the secret headquarters of the Nazi military command. There is some extremely weird stuff there….. Thanks for adding the links to St Bernard. I’ve added them to the text. There is other information in German about the sculptor, but I didn’t get around to digging it all up again. …Nope, haven’t given up on Lipton — still another 40 or so posts to come. Maybe I’ll try swimming the English Channel to see if my stamina is up to it yet.